Carpet cleaning equipment like the common vacuum can remove most of the dry soil, but it is also necessary to clean your carpet on a regular basis to remove the oily, sticky soil that builds up in the pile as a result of cooking vapors, air pollution, and tracked-in dirt from outside. The particles of oily soil deposited on carpet fibers can cause gradual but significant dulling of delicate pastel colors; the color isn't lost but is hidden under the film. If this type of soil is allowed to accumulate, it begins to attract and hold the dry soil. Choice of the proper carpet cleaning equipment and system is important. Some systems may leave residues which promote re-soiling and defeat the whole purpose of cleaning. The recommendations below represent the best current knowledge and should help prolong the time between cleanings. We recommend the hot water extraction system, which research indicates provides the best capability for cleaning. This carpet cleaning system is commonly referred to as "steam cleaning," although no steam is actually generated. The process consists of spraying a solution of water and detergent into the carpet pile and recovering the water and soil with a powerful vacuum into a holding tank. This can be done from a truck-mounted unit outside the home with only the hose and wand brought inside or, where a truck-mounted unit cannot reach, by a portable, self-contained system brought into the home. It is to your advantage to use professional cleaners because their experience enables them to do a better job than you can do yourself. Their equipment has more extraction power than the rental units available to you, and the carpet should dry more quickly. True professionals have also made the investment in training to understand the equipment, to know the proper cleaning agents for the situation at hand, and to recognize the differences in fibers and carpet construction. One way to locate a professional cleaner is to contact the Institute of Inspection, Cleaning and Restoration Certification (IICRC) at 1-800-835-4624. This organization maintains a national directory of independent professional cleaners who are trained and certified in a variety of cleaning specialties. Call and explain that you have purchased carpet, and be sure to ask for a cleaner near you who uses the hot water extraction system. Some rental companies have cleaning equipment that is similar to what the professionals use. The cleaning equipment should have enough vacuum power to allow the carpet to dry within 6 to 12 hours after cleaning. Avoid rental units found in many retail and grocery stores that do not have enough power to extract the cleaning solution from the carpet adequately and which may actually damage the carpet due to overwetting. Avoid overwetting the carpet. 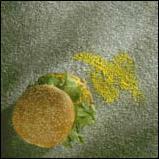 Prolonged dampness may promote growth of mildew and bacteria in the carpet or cause separation of the backing. A carpet that is wet for more than 24 hours could develop a growth of mold and mildew. Most problems in do-it-yourself cleaning are due to overwetting and use of excessive detergent. Use a cleaning solution with a pH less than 10, preferably near 9, and with a minimum of non-sticky residue. For wool and wool-blend carpets, use a cleaning solution that has been formulated for wool and other natural fibers and has a mild pH range of 5 to 8. We recommend a clear water rinse after cleaning. Do not use any silicone-based anti-soil treatments on carpets. The only anti-soil products approved for use as needed are either DuPont Teflon or 3M Scotchgard. Reduce drying time by using several fans to move air across the carpet in combination with a dehumidifier or air conditioner to pull moisture out of the air. Carpet should be dry within 12 hours; even less is better.